Genetec is making a big bet on the cloud. Indeed, it is the biggest bet any VMS vendor has yet made for VSaaS and the most significant move in the VMS market in years. In this note, we look at what it is, what it means and how it compares to current VSaaS, especially Axis AVHS, and their #1 rival Milestone's VMS offerings. Genetec is porting their Security Center software to run on Microsoft's cloud infrastructure, Azure. This will make their key VMS, access control and LPR capabilities available as a service. While Genetec plans to offer it as both cloud only and as a hybrid offering with their existing server based solution, the immediate focus is expanding into the small and medium size business market - an area where Genetec has been the weakest in, given their historical focus on high end, large scale deployments. Genetec, with Microsoft, will manage and host the service. The service will be sold through Genetec's traditional channel, not direct. An enhanced web client will be used to connect to the service. Cameras adding plug n play /'phone home' support will help simplify connection to Genetec's service/data center (specifics not disclosed though we suspect Axis is the obvious first choice). Edge storage will be available as part of Genetec's already developed trickling feature. While the core functionality will be similar to existing Genetec Security Center, the biggest potential advantage is to eliminate the need to install, optimize and maintain a Genetec system. This has historically been one of the biggest complaints about using Genetec. Doing this could expand Genetec's core market greatly and remove one of the biggest barriers to wider deployment. Much more advanced features: Genetec is using its mature, high end Security Center offering, far more sophisticated than the rudimentary video management of Axis AVHS. Eliminates Axis multi-tier partner structure: Genetec has a simple operational and sales model, bundling all elements and selling it through its existing channel. By contrast, Axis developed an awkward, complex and costly structure of licensing AVHS software to hosting providers (like EMC) who re-sold to national integrators who then resold it to regional integrators. However, the biggest unknowns are price and what it really looks like when it is ultimately released. However, it does have significant potential to leapfrog AVHS in overall performance and capabilities. Axis's free VMS killer, ACC, is at the opposite end of the spectrum to Genetec cloud; One is a free, proprietary, simplistic offering, the other is a high end, likely expensive (relatively speaking), solution. While both have their place, we do not see them competing head to head. Eliminate the on site server (like any other VSaaS). Eliminate the complexity of setting up Genetec (which is a common complaint of both Milestone and Genetec). A mature, proven server based solution instead of a new offering that might not be fully baked until 2014. Broad 3rd party camera support. Genetec will likely only have edge storage support / plug n play for a handful of camera manufacturers as it is time consuming and costly to develop such integrations. 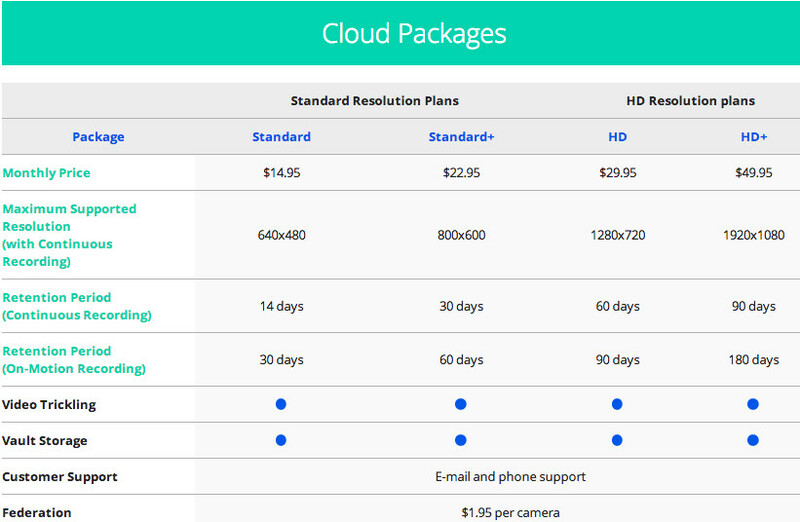 Milestone's licensing is relatively cheap at $49 to $99 per channel license. If Genetec can deliver on the cloud offering, it could improve its lower end positioning but it still faces many well established server based competitors in the small to mid market. It seems that every time Genetec releases a major new feature, Milestone follows within the next year (e.g., Milestone Corporate releases tend to piggyback the previous Genetec Security Center release). We would not be surprised if the publicity around Genetec's announcement accelerates a Milestone response for a similar offering in 2013.
Who knows what will happen. This is a mid November 2012 announcement for a targeted mid 2013 release date. From what is disclosed today, it is more concept than shipping solution. But it is bold and it could fundamentally shift Genetec's market position. They are on the clock now. Let's just hope it's not a repeat on the endless delays of the SMC.